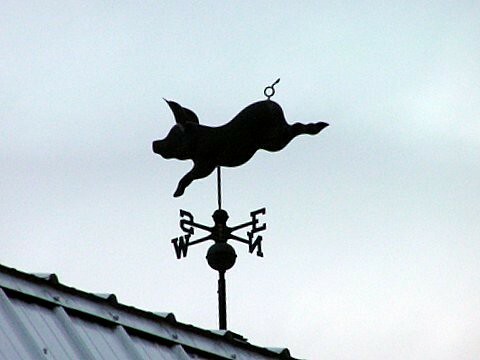 i will do needful: Pigs fly! "Ritter says Warner Chappell is now talking with him about ways to create lyrics search tools with the blessing of music publishers, but the experience will cause him to think twice before committing his next big idea to code." Like the Sony fiasco (the link will take you to an article called How Sony became an ugly sister - number 1 search result from Google news using the word "sony"...!!) and the Grateful Dead reversal, let's hope the Warner apology represents another small shift in the entertainment companies' collective understandings of what people will or will not tolerate. Let alone the abundance of talent and good ideas out there just waiting to be discovered. Another feel-good story this week is Worldchanging's post on India's Traditional Knowledge Digital Libraries (TKDL), which has accumulated 30 million pages of data documenting traditional medicines and practices in "abundant detail". "The goal isn't to restrict the use of these traditional medicines, but to ensure that they cannot be patented in places like the United States and Europe because of a lack of documented "prior art."" ...this kind of feudalism coupled with monopolism destroys the open commons nature of the internet. Most, if not all of the major business successes and innovations on the internet (Google, Amazon, Ebay, etc) have been due to the internet's fundamentally open nature." Buggars. If they think we're going to accept a future where we serf the net, they've got another thing coming. Like bankruptcy.